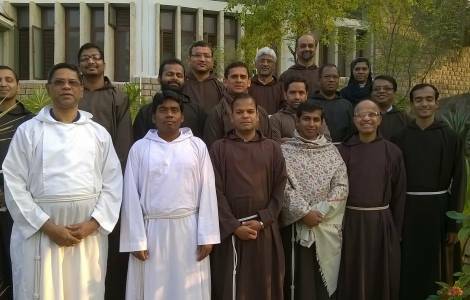 Kandhamal (Agenzia Fides) - Four survivors of the worst anti-Christian violence in modern India on December 27, 2018 were ordained as Capuchin priests. Two times attacked in 2007-2008 Arundaya Capuchin ashram Minor Seminary of Barokhoma run by Capuchin Fathers saw four new priests: Rahul Bastaray, George Patmajhi, Anand Pradhan and Amar Kumar Singh. According to information sent to Agenzia Fides, about 1500 people including 47 priests and 20 nuns assembled for the Priestly ordination ceremony at Mary Matha Parish, Simonbadi, Kandhamal district under Cuttack-Bhubaneswar archdiocese of Odisha state. "Over a thousand years after Abraham, the Jews were living as slaves in Egypt. Moses led the Jews out of slavery in Egypt and led them to the Holy Land that God had promised them. It was a challenging call for Moses from God", said Msgr. Sarat Chandra Nayak, the Bishop of Berhampur in his homily. God knew very well if any human being is not free he or she is not a true human being. The constitution of India allows us to choose any religion to practice but there is anti-conversion law in some states of India. God chose you like Moses to be faithful, responsible to lead the people added the prelate. We have lost everything due to the communal violence of 2007-2008 but not our faith in Jesus Christ because God preferred to live in us as we have celebrated Christmas on 25th December continued the Bishop. "Ten years of communal violence could not stop ten years of priestly formation", said Ananda Prdahan the newly ordained priest one of the victims of Kandhamal anti-Christian violence of 2007-2008. The perpetrators burnt the Arunadayo Ashram, Minor Seminary in the first attack in 2007 which started in Christmas time in Bamunigam. 24 seminarians had to run to the forest to save their life from the Hindu Extremists. They had to vacate the Seminary. They came back after renovating the houses in the month of June 2008 to continue seminary formation. Once again the worst anti-Christian violence of 2008 started in the month of August 2008. The Hindu Extremists once again burnt, destroyed and looted the things of the Seminary. 20 seminarians had to go the nearby village and remain for two weeks with the Christians to share the pain and agony of the people. "The people of kandhamal are poor in wealth but they are rich in faith in Jesus Christ. They are the inspiration to the Modern World", said Melchior Kata, Provincial Minister of the Capuchins’ Mary Matha province Andhra, Telengan and Odisha, who was present at the ordination ceremony. Father Pradhan’s mother Kristina expressed gratefulness to God over her son’s ordination. "When God is with us who can be against us", said Kristina in tears remembering the inhuman persecution of 2007-2008. The four priests joined the Arundaya Capuchin Ashram Minor Seminary, Barakhoma, in 2006 after completing their High school.